Saxon is celebrating 25 great years of Heavy Metal duty, they are a true survivor of the NWOBHM.. Saxon played as headliner at the Wacken 2001 with Budgie their mighty iron eagle (a DVD will come out soon) and believe me they are coming back with a killer album. THIS ALBUM IS A MUST FOR EVERY METALHEAD. How on earth can a band after such a long time in the business be so inventive, motivated and play so many great riffs, bridges and solos ??? The band is at its best, the rhythmic parts are powerful, Biff sings great and the production is big, very big. It is for sure pure Heavy Metal and it has a crystal clear and powerful production. Some songs sound very 80's and some have the kick of the actual Power Metal. So it is very actual for old timers like Saxon. Killing Ground is a GREAT performance by a living legend !!! The great Saxon logo and a Metalhead what do you need more on the cover and you will get what you need inside: the cd sounds like a best of from the 25 years of the band. Danny told me that it is like they would have taken one bonus track from everyone of the previous albums and put them all together in one cd. You have old boogie songs like Coming Home, AOR songs like Hell Freezes Over (listen to the bridge and the solo...) and great Heavy Metal Anthems like Killing Ground, Dragons' Lair, Deeds Of Glory (what a chorus) or Rock Is Our Life. OK I do agree that the ballad Court Of The Crimson King shouldn't be on second position but it is the way it is and it is a cover from King Crimson so let maybe take it as a bonus track. This album is coming out on the 25th of September and there will be a limited edition with oldies recorded again. Titles like Wheels Of Steel, Heavy Metal Thunder, Strong Arm Of The Law, Dallas 1 P.M., Princess Of The Night, And The Band Played On, Power And The Glory and Crusader sounding 2001 is a must for every one. 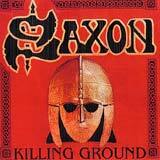 And for all those who want to know a bit more about Saxon a best of will come out in 2002. So that's all for today.